On Monday, 31 October 2016, the judging panel for the Governor-General’s Prize met at the High Court in Sydney to interview the six finalists in this year’s essay competition. The finalists wrote essays on different topics concerning the Australian Constitution in times of war — a theme chosen to mark the centenary of the First World War. The judging panel was chaired by High Court Justice Stephen Gageler, who said, "The Governor-General's Prize fosters an appreciation of our unique constitutional history which can only be to the future benefit of all Australians." Other members of the panel were Australian War Memorial Director Dr Brendan Nelson, ANU Professor Fiona Wheeler, and Baker & McKenzie partner George Harris. 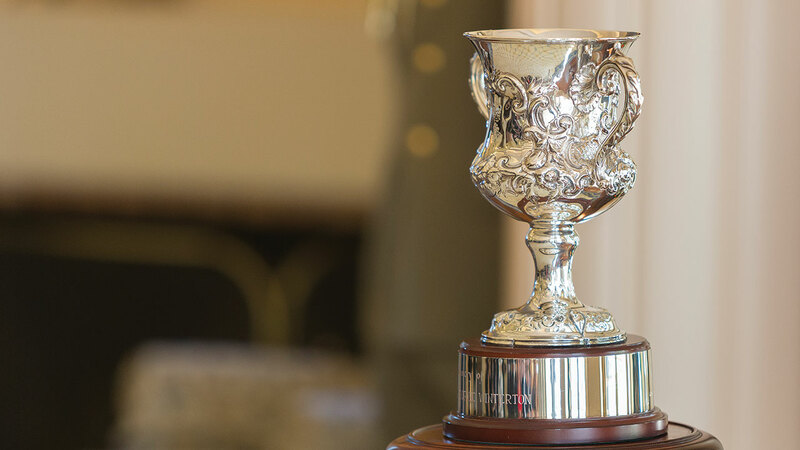 The George Winterton Cup for equal first place was awarded jointly to Rose Mackie, who studies at the University of Tasmania, and Timothy Smartt, who studies at the University of Sydney. Ms Mackie wrote an essay about the impact of the experience of war on the development of the vertical fiscal imbalance between the Commonwealth and the States. This is a topic which, she explained, is a problem about which her fellow Tasmanians are acutely sensitive today. Mr Smartt wrote an essay arguing that the Australian Delegation at the Paris Peace Conference of 1919 punched above its weight in terms of what is achieved, given Australia’s constitutional status prior to the First World War. He became fascinated by the difficulty of identifying whether there has been a moment when Australia acquired independence. Kylie Lacey, a student at the University of Western Australia, was highly commended for an essay evaluating the necessity, desirability and effectiveness of Prime Minister Billy Hughes’s plebiscites on conscription in 1916 and 1917. She enjoys archival research, and drew on letters, newspapers, and other documents that she found in the National Archives of Australia and the Australian War Memorial when preparing her answer. Other finalists included Murphy Bong, a student at Monash University, Matthew Paterson, a University of Queensland student, and Jarryd Roberts, who studies at ANU. Mr Bong wrote about the Commonwealth Parliament’s capacity to legislate with respect to unconventional forms of conflict in times of conventional peace. He was interested in how wartime experience might shed light on the thinking that underpins how governments understand their approach to civil liberties in peacetime. Mr Paterson discussed the statement, “The Governor-General is every bit as much the Commander in Chief of the Australian Defence Force as the American President is the Commander in Chief of the United States Armed Forces.” He has an enduring interest in the institutions through which decisions are made, and has developed an interest in the historian E.H. Carr’s approach to understanding historical concepts. Mr Roberts answered a question discussing the scope of the Commonwealth’s legislative power in times of war. He was particularly interested in investigating the relevance of High Court jurisprudence during the First World War for contemporary discussions about issues such as terrorism, and in presenting such discussions in a way that attracts non-lawyers to think about the relevance of these issues for our understanding of current affairs. The Constitution Education Fund is proud to have created opportunities to recognise the achievements of Australia’s future leaders through the Governor-General’s Prize for over a decade.